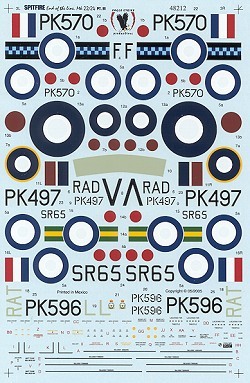 This next new sheet is also for the Spitfire F.22 and includes markings for four aircraft. Standard camo was Dark Green/Ocean Grey over Medium Sea Grey with a Sky fuselage band and spinner. 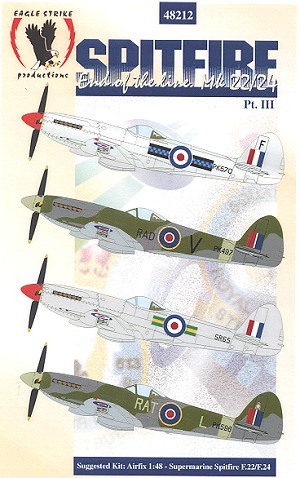 For kits, you have the excellent Airfix version, which may be a tad difficult to find from time to time. First up is this overall silver or bare metal aircraft from 603 Sq with post war roundels, circa 1949-51. It has a red spinner to add some color. Next is a 504 Sq aircraft in the standard scheme circa 1948 with wartime roundels. From 1 Sq Southern Rhodesian AF in June 1953 is this overall light grey aircraft with a red spinner. Finally another RAux AF aircraft, this time from 613 Sq in 1949. There are enough roundels for three of the aircraft if one chooses wisely. Data markings are given for one aircraft.